Hanover, July 7 2014: On this day nine young professionals from the whole Salzgitter Group met for the first time in order to start the Salzgitter International Training Program 2014. The SITP consists of 3 different modules of 4 or 5 days each. It isn’t called “international” for nothing: Our nine participants come from France, Italy, Hungary, Mexico, India, the United States as well as from all over Germany. 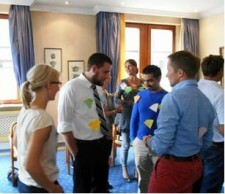 The common target of the SITP group is to work on its soft skills (e.g. teambuilding), to get to know new working techniques (e.g. setting priorities and planning effectively) and, last but not least, to increase intercultural awareness and self reflection. Moreover, our guests from abroad could learn first-hand about Germany and the Germans – a truly unique cultural experience in the days of the World Cup. Naturally, a guided plant tour of the Salzgitter steel mill was on the schedule as well. But enough said: I should let them tell the full story in their own view! I wish you an enjoyable read and as always Glückauf! One of the biggest challenges current and future leaders face is to be able to „lead themselves to personal excellence“ before going out and attempting to lead others. As a large international company, Salzgitter has employees located all over the world. During the week of July 7 – 11, nine of these employees from seven different countries came together to participate in the 2014-15 Salzgitter International Training Program (SITP). The goal of this program is to foster leadership development and networking between employees with international contact and tasks. Our first module was led by our CONTUR trainers Stefanie Wurm and Michael Hardtmann and was accompanied by the Salzgitter HR Program Head, Frank Gießelmann.